Call graph construction for object-oriented programs is often difficult and expensive. Most sound and precise algorithms analyze the whole program including all library dependencies. The separate compilation assumption makes it possible to generate sound and reasonably precise call graphs without analyzing libraries. We investigate whether the separate compilation assumption can be encoded universally in Java bytecode, such that all existing whole-program analysis frameworks can easily take advantage of it. We present and evaluate Averroes, a tool that generates a placeholder library that overapproximates the possible behaviour of an original library. The placeholder library can be constructed quickly without analyzing the whole program, and is typically in the order of 80 kB of class files (comparatively, the Java standard library is 25 MB). Any existing whole-program call graph construction framework can use the placeholder library as a replacement for the actual libraries to efficiently construct a sound and precise application call graph. Averroes improves the analysis time of whole-program call graph construction by a factor of 4.3x to 12x, and reduces memory requirements by a factor of 8.4x to 13x. In addition, Averroes makes it easier for whole-program frameworks to handle reflection soundly in two ways: it is based on a conservative assumption about all behaviour within the library, including reflection, and it provides analyses and tools to model reflection in the application. The call graphs built with Averroes and existing whole-program frameworks are as precise and sound as those built with Cgc. 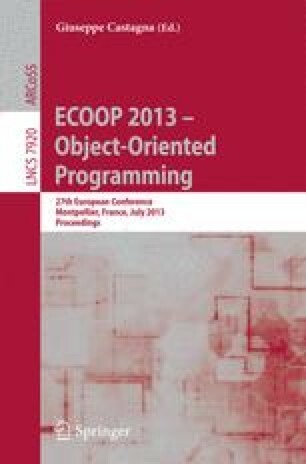 While Cgc is a specific implementation of the separate compilation assumption in the Doop framework, Averroes is universal to all Java program analysis frameworks.